The movie based upon Landria Onkka’s Outskirts Press book, The Rooftop Christmas Tree, premieres tomorrow night on UP, so we caught up with Landria to find out more! Outskirts Press: You published your first book, The Rooftop Christmas Tree, with Outskirts Press in 2014. When did you first get a sense that you had written something really special that was going to touch a lot of people? Landria Onkka: I knew immediately that this was different because it is based on a true story that, simply put, is proof of miracles. The world seeks hope and one of my missions is to share the message that ‘all things are possible.’ I spent quite a bit of time watching holiday movies to get a sense of what was out there, and recognized that there is a huge market for family and inspiring content. When I sat down and wrote both “The Rooftop Christmas Tree” and the sequel, “A Bell for Christmas,” I never doubted that they would end up on television throughout the U.S. The first time I told the story to friends, every one of them cried! I still cry at the ending and I am so excited to see it come to life with the awesome actors the production team chose! Outskirts Press: The Rooftop Christmas Tree has won a number of awards and recognition. Please tell us about that. Landria Onkka: Although I never let ‘one thing’ dictate whether or not my story is a success, awards can be good indicators. I sought out those contests that had positive reviews and credible critics. My first award was the East Coast Writers Award in Boston. It was honorable mention. I didn’t get a notification and at midnight of the day of the announcement I thought, “what the heck, I’ll go online to see who won” and was ecstatic to see my name! This was, after all, my first book and first contest! The book went on to win the Grand Prize at the Hollywood Book Fest last year. They flew me to Hollywood to accept the award and it really sunk in that I had a marketable and appealing story. “A Bell for Christmas” just took Grand Prize in Hollywood this past July. The judges said it’s the first time they had an author win two of their awards. I didn’t realize the depth of the accomplishment until a well known sportscaster attended the ceremony told me that it took him 15 years to get an award for his writing! That brought it home that I was on the right path. Outskirts Press: That is impressive! And, as you mentioned, the big news is that The Rooftop Christmas Tree was optioned for a movie! Congratulations! Tell us about how that happened. Landria Onkka: I spent 20+ years in investment banking with a specialty in entertainment. So, I had a good handle on what producers and investors liked. I had worked on some major, well known movies and television series, but always on the business side. Now I was the writer and it was a totally different ball game! I stuck to what I knew would have a chance at an option which is why my first book reads a bit like a screenplay. I made it easy for a producer to translate it into a movie. In fact, they kept my title, most of the character names, and stuck very close to the story (which is unusual). I got optioned within a few months of submitting my work to an agent and a few months later they went into production. My agent told me that she has never had that happen! If a ‘first book’ writer is fortunate enough to get optioned, they usually sit on it for a few years and most of the time it never makes it to the screen. I am thanking the Universe every day for my success! Outskirts Press: How involved were you during the production of the movie? Landria Onkka: I had no involvement in the movie! As a former investment banker, I was able to quickly sign off on my contract because I already knew that the book writer is separate from the screenplay writer and the producers. It was important to hand it off to the pros which includes multiple award winning producer David Winning and let them do their magic. Once I establish my track record, I can then request some involvement in the production. However, I don’t recommend writers do that. Writing a story and producing a movie are two different things. Writers own their books and producers own the movie. That’s a good thing! Producers don’t want writers telling them what to do! “A Bell for Christmas” ‘first right’ went to my producers. I will know shortly what they will do with it. In the meantime, I have five more books coming out! Outskirts Press: What marketing efforts did you take leading up to the movie’s premiere? Landria Onkka: None! I made announcements, but thank goodness Outskirts Press has marketing programs and advice that they share about all of this! While UP TV handles all of the movie marketing, this is an incredible opportunity for me to promote my books! I’m still learning and now I have a Mini-course for writers, blogs, and Facebook set up to share with readers and writers! I have been invited as a guest writer for various websites, so I expect to continue to grow my fan base. It’s been a big learning curve for me! That being said, I already knew that my friends who went with traditional publishers had very little control over their marketing which posed issues. If the publisher doesn’t put marketing efforts into their books, then nothing happens. I learned from their experiences. They were tied to long contracts, had little control, small royalties, and marketing efforts were non-existent in the case of my friends. What money they earned upfront went into their own marketing efforts. Outskirts doesn’t place one author’s importance over another’s. They extend their support equally to ALL of their authors! Outskirts Press: The Rooftop Christmas Tree is a heart-warming tale, and ideal for this season. Any stories of how its message positively affected your readers and/or movie viewers? Landria Onkka: I wrote the book as a fiction story because I wanted to add a romance. We all love romance! That part was fabricated. However, the most powerful message is “Miracles ARE Possible!” which is played out by one of the lead characters, Mr. Landis (beautifully played by Tim Reid). Year after year, he places a Christmas tree on his roof and spends Christmas in the courtroom and sometimes, jail. He is the rock throughout the story that reminds us that no matter what happens outside of ourselves, if we have faith, everything works out in ways that we sometimes can’t imagine. My friends would often say, “The ending wasn’t true, right?” The answer to that is that it ‘is’ true! Many people cry at the ending because it’s so powerful and positive. This is the first of what I call ‘The Miracle Series’ that demonstrates that all things are possible. Outskirts Press: Your second published book, A Bell for Christmas, is also Christmas related, and was published by Outskirts Press in May 2016. Do we sense a theme here? Landria Onkka: When I read my movie contract, it requested ‘first right’ on the sequel. What? A sequel? Because “The Rooftop Christmas Tree” was based on a true story, it didn’t occur to me to write a sequel. 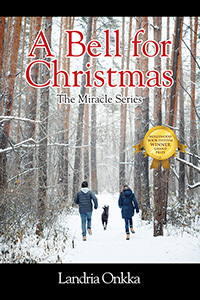 So I got busy and within a few months of the movie production, I published “A Bell for Christmas!” My goal is to write a television series based on this quirky, small town where anything is possible! Outskirts Press made it incredibly easy to get the book out quickly. Once I approved the final copy, it was available worldwide and on Amazon within two days! While I personally shot the cover for the first book, I couldn’t do the same for “A Bell for Christmas” because we don’t have snow in Atlanta. Outskirts sent me to a free site with thousands of possible covers that didn’t require royalties or a release. I couldn’t have envisioned a better cover, that depicts an actual scene in the story. I have researched many publishers and I am so glad that I went with Outskirts. I have full control and 100% royalties. When I signed the movie contract, I didn’t have to check with my publisher to get a release, or get permission. I own my books! It doesn’t get easier. This is what I teach other writers because most aren’t thinking about having a movie made! The speed, quality, and control I gain from Outskirts is unmatched in my opinion. Outskirts Press: You mentioned five more books. Are these all written for The Miracle Series? Landria Onkka: Wooden Mistletoe is going to press within the next 60 days. Yep, another Christmas story that is ideal for television. 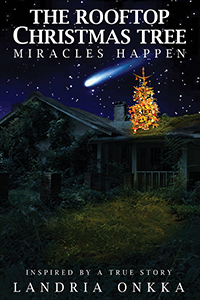 I have many more Miracle Series stories and plan on releasing 2 to 3 annually in this uplifting series! Outskirts Press: Do you have more books planned and/or already written on other topics or subjects? What are your plans for publishing them? Landria Onkka: The Mystery Series and The Mystical Series were just added! My biggest problem is keeping up with all of the ideas that are flowing. One of my books in the Mystery Series is another ‘based on a true’ story and is a murder mystery. Because it is a long book and well suited for the Big Screen, I considered taking it to a big publisher and found out that the process can take, and usually does, two years or more! It’s going to Outskirts the first of the year and then going to producers. Again, I can’t stress the benefits of self publishing enough! It has allowed me to accelerate my success! Outskirts Press: If you wanted to offer advice to writers interested in following in your successful footsteps with an award-winning book that gets turned into a movie, what would you say? Outskirts Press: Thank you, Landria. And congratulations on your success! Be sure to catch The Rooftop Christmas Tree when it premieres tomorrow night. Click the screen-cap below for showtimes and the trailer. I would suggest that there is not an apostrophe in pros. Great observation. Thank you for your comment. Previous Previous post: Add a little FLASH (sale) to your Black Friday this year!